The current North Bend library was opened in 1913. 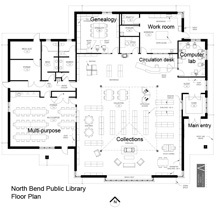 Ninety-five years later, the North Bend Library Board decided it was time for a new building, one would be accessible by all of North Bend's citizens and meet the needs of a modern library user. "Considering that it is approaching 100 years old, the building is in good condition. However, it is seriously deficient when compared to contemporary requirements of both building codes and current library functional needs. In general, many of the building's systems, finishes, components and furnishings are worn and dated." The plans for a new library include a computer lab that could hold up to 20 computers, a genealogy research area, and plenty of space for the library's employees and patrons. The Friends of the Library, Library Foundation, and Library Board are currently in the process of raising funds to pay for a new building. It is going to take a community-wide effort to get a new library built. Any one who is interested in the process is welcome to attend Friends of the Library meetings, which are generally the third Monday of the month at 7 p.m.
• Dec. 2009: The Library kicks off its capital campaign to raise funds for the new building. • Read the story about the latest architect's plans released in Jan. 2009 and see what the exterior is going to look like. 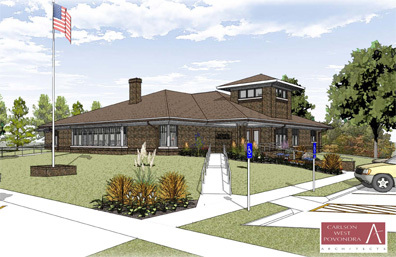 • Read the Eagle article about a $50,000 donation to the library project. 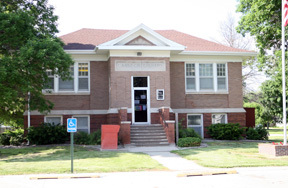 • Read the Eagle article on the decision replace the current library with a new one. • Take a video tour of the current library. • Visit the official website of the North Bend Library for information on upcoming fundraisers.